I have enjoyed getting back into the Windows Phone community and part of that enjoyment has come from listening to readers and colleagues in the community on all the devices that are out there today. If there is a phone size with particular features or budget point, chances are there is a Windows Phone for you to fit the need. I’ve been fortunate this week to not have just one but two Nokia Lumia phones in house to review. The first is the Lumia 1320, the budget minded Phablet. Make not mistake: The 1320, like it’s big brother the 1520, is huge. But it is also very feature rich, taking full advantage of that massive 6″ display and the battery life is unbelievable. Having spent a few days with the Lumia 1320 I’ve got a good first impression of the device and while a full review will be coming next week, I wanted to give readers a preview and my overall impressions after a few days. ClearBlack IPS LCD 6″ display. It is massive. But it is not overly so to the point where you cannot hold the device comfortably with one hand. I fully admit I have big hands but having show this phone to a few friends, including some ladies, none of them had trouble holding the device. But every single one of them was blown away by the clarity of it. The display is also sensitive enough to be used with longer nails or with gloves one. Performance wise the Lumia 1320 has been impressive. It is powered by dual-core 1.7GHz Snapdragon S4 processor. When I first got the device I was concerned that the massive display would eat up a lot of CPU cycles to keep it refreshed. That doesn’t seem to be the case so far. The second thing you will notice is the weight of the Lumia 1320. It comes it at a hefty 220g, nearly double the weight of the Lumia 635 (which weighs in a 145g). You notice it but I would suggest that is overbearing. If you are use to carrying a tablet like an iPad Mini, you really won’t think much of it to be honest. If however you are use to carrying around an iPhone or Galaxy S5, yeah, you will notice it. I still don’t have Update 1 on it however as it’s a loaner unit and I can’t do the Developer Preview on it. If there is going to be one area of disappointment with the Lumia 1320 is probably going to be the camera. It comes in a 5MP which is pretty low end at this point. That said, the 1320 does have a front-facing camera which seems to be a rare thing these days on Windows Phone (again, why? In this selfie driven world we live in, why?) I haven’t had a chance to go snap photos with it yet so I’ll reserve judgement. One nice thing, it has a flash. That could come in handy in low light situations. 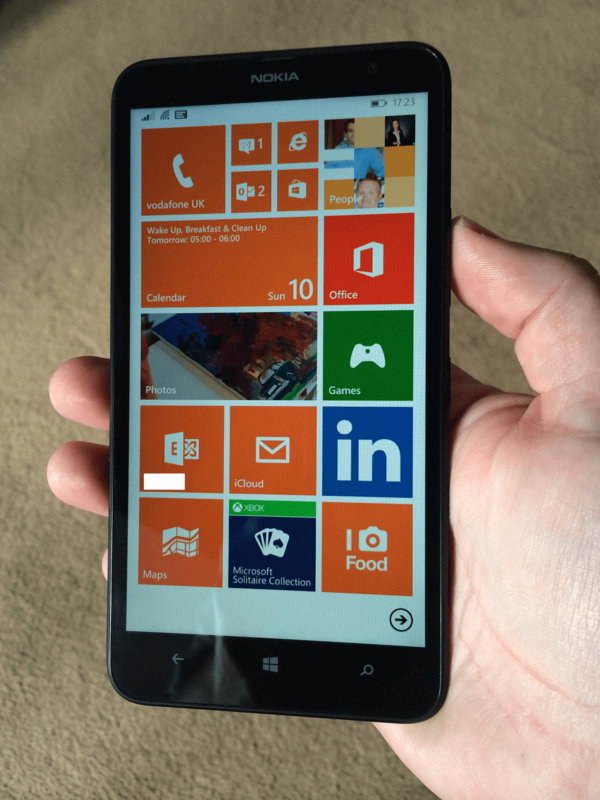 I’ll have the Lumia 1320 for a few weeks and will get a full review out on it in that time. So far I’m impressed with what I’ve seen but I’ll have to spend time with it daily to really come to grips with it and see how it performs. If you have any questions about the Lumia 1320 be sure to leave a comment down below and I’ll do my best to answer them for you. I think they’ve concluded that prtioomng “Windows Phone” doesn’t get them anywhere. But the recent branding of the upcoming HTC phones as Windows Phone 8X and Windows Phone 8S seems to show that Microsoft and/or HTC still has the (misguided?) belief that the Windows Phone brand still has some value.I’m surprised at all these leaks about Microsoft’s rumored phone, especially after they’ve managed to keep the Surface tablet a secret. Even if it’s true, I’m not even sure if it’s smart to use the Surface brand for phones. They already have Surface RT which doesn’t run everything Surface Pro can. Then a Surface Phone that won’t share apps with the tablets at all. (Well, Samsung is following the same tack with the ATIV brand, so maybe it can work. )As for keeping the carriers out of the loop, it’s been done before, with little success: Google’s first attempt with the Nexus One, Nokia’s Symbian smartphones in the US, Dell with the Venue Pro. Google’s $350 Galaxy Nexus is a pretty good deal for an unlocked, unsubsidized phone, but sales still pale in comparison to the Galaxy S III.